Gambling involves betting money (or other valuables) for the chance to win money or other things. Some gambling activities (such as darts or pool) require skill, where other activities are based on luck (such as the lottery, slot machines, or online games). Gambling can be risky regardless of the activity. 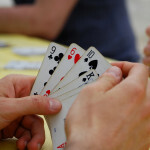 Many people enjoy gambling because it can be a way to socialize (such as going to a poker night with friends). There’s also the possibility of winning money or other items, which can be really exciting. Some people also gamble because they’re influenced by friends or family members. They may see a friend, an older sibling, or even a parent gambling and want to join in. Additionally, there are people who gamble because they’re bored, or use gambling to distract them from their problems. It might be hard to realize that you have a gambling problem, because a person doesn’t experience the same physical affects as a drug or alcohol problem. However, a gambling problem can be just as serious, and in fact, you can even become addicted to gambling. Do you constantly think about gambling and the next time you can play? Do you make excuses about avoiding things you need to be doing (studying, homework, etc.) so you can gamble? Has gambling caused you to get in trouble at school (being late/absent, getting bad grades, etc.)? Do you find it hard to stop gambling? Has gambling made you anxious, easily irritated, or distracted? Do you lie to family or friends about gambling? Have you given up other activities or hobbies to gamble? Have you spent money on gambling that you were supposed to use for other things (food, transportation, etc.)? Have you borrowed money from family and friends to gamble with? Have you sold personal things (electronics, jewelry, etc.) to get money to gamble with? Have you ever stolen or committed a crime to get money to gamble? If you answered yes to one or more of these questions, you may have a gambling problem, and you should get help. What are the consequences of having a gambling problem? Having a gambling problem can cause legal problems, financial (money) problems, and physical and emotional problems. Something to think about: The reason casinos and online gambling sites stay in business is because the odds are against the player. More often than not the casinos or sites are making a profit, not you. Even though you might be having “a good day” or “good luck,” it’s likely that you’ll end up losing money. I think I have a problem. How do I get help? If you think you have a gambling problem, spend more time with your friends and family and participate in activities that are unrelated to gambling. You might want to take up a new activity, such as playing a new sport or learning a musical instrument. Check out Gamblers Anonymous to locate a meeting, learn about recovery programs, or find a number for a hotline in your state that you can call to talk with someone confidentially over the phone. Hotlines are available here. Gamblers Anonymous is a group of men and women who come together to help each other solve their problems with gambling. Even though a gambling habit may seem be hard to break, you can do it! There are many people and services available for you, so don’t be afraid to reach out for help. If you’re concerned about gambling, here’s a tip on how to bring it up with your health care provider: I think I might have a problem with gambling. How can I get help?